I grew up with a blue Schwinn bike. It had a bell strapped to the handlebars, and a pedal guard to keep your pants from tangling in the chain. I rode that bike every day, uphill to school, and downhill home again. In the afternoon I liked to veer hard onto the last steep downhill block and take it at top speed, then coast the rest of the way home on sheer momentum. The only problem was that the bottom of the hill was an uncontrolled intersection—no stop signs in any direction. I had to be alert as I furiously careened into that corner. If a car was coming to my right or left, I was ready to ditch the bike at the last instant, without a second thought. I didn’t wish for a stop sign, so I could have the right of way through the bottom of the hill. Instead, I would have preferred to get up enough speed to actually lift off the roadway, to gain an altitude of twelve feet or so and soar over any car that might be approaching on the cross street. The dream of a flying bicycle! Even at the very moment I was taunting death at the intersection of Dearborn and Center Street, a British company was working on it. 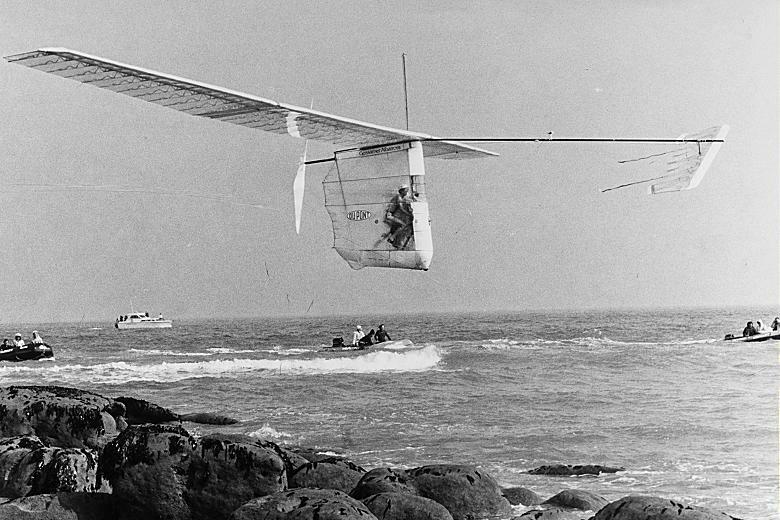 Dr. Paul B. MacCready led the AeroVironment team developing pedal-powered aircraft in the 1970s. The Gossamer Condor was the flying machine that won them a prize of 50,000 pounds in August 1977. Rider Bryan Allen propelled the Condor over a figure eight course at a minimum altitude of ten feet, around two markers a half-mile apart. It didn’t have wheels, so it wasn’t exactly a flying bicycle, but the Gossamer Condor did fly under the power of a rider cranking foot-pedals to turn a propeller. 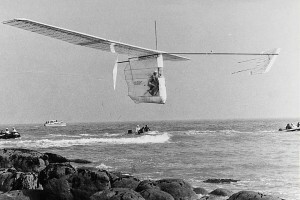 In June 1979 Allen piloted a more advanced human-powered aircraft called the Gossamer Albatross across the English Channel. The distance was more than 22 miles. The Albatross weighed about 70 pounds and had a wingspan of almost 100 feet. The pilot sat on a bicycle seat, wearing a helmet, inside a transparent plastic bubble that hung below the wings. During the Channel crossing, boats were following the aircraft, and pilot Allen radioed down that he had reached his limit. The exertion of pedaling that huge two-bladed propeller was grueling, and he couldn’t go any further. Allen was given permission to crash-land the Albatross in the choppy sea. He stopped pedaling, and the plane began to lose altitude. Unexpectedly, Allen found that as he descended, the air currents closer to the water’s surface made for easier flying. He began turning the pedals again, and the Gossamer Albatross completed the Channel crossing on its first attempt. I can only take off by careening downhill. And I’ll fall to the street if I ever once stop. I‘m still eager to have a flying bicycle, suitable for pedal-powered commuter aviation. It would have a cruising altitude of, say, 55 feet, and an average speed of maybe 15 miles per hour. You’d follow the urban roadways, the same as all the motorized vehicles. But they’d be below you. And you’d fold up the wings and park it with a chain lock at a bike rack. In the meantime, a hand-made pedal-powered plane fills an important role in the manuscript for my novel, Silver Sparks. I still haven’t gotten over that obsession that took hold of me on the way home from school in the seventh grade. And you were so sure that it never would fly! 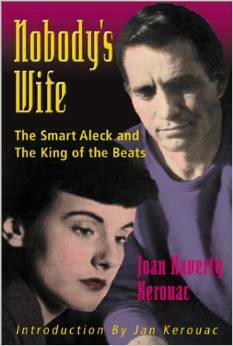 Becoming friends with the remarkable Jan Kerouac was one of the great pleasures for me in acting as the editor for her mother’s book (Nobody’s Wife: The Smart Aleck and the King of the Beats, by Joan Haverty Kerouac—see my last blog post). When Jan’s brother David allowed me to take the treasure box of Joan’s manuscript pages, both he and I knew my first challenge would be to convince Jan that I was capable of a huge job. The manuscript was a mountainous mess of paper. It required somebody to care about it, to give attention to every detail, to step it tenderly through a complex range of editing issues: sorting and indexing the pages, transferring them from typescript to computer, comparing multiple versions, revising, rewriting, sequencing, compiling, and proofing. And once those tasks were done, there would remain the mission of selling it to a publisher. Jan Kerouac was already an accomplished novelist when I had my first nervous phone conversation with her in 1993. The two novels published during her lifetime, Baby Driver (1981) and Trainsong (1988) established her as an outstanding literary talent. Both these books shed light on the close, tangled relationship between Jan and her mother Joan. What Jan most earnestly wanted was to edit her mother’s manuscript herself. But Jan was in very poor health, from kidney failure and other issues. She was on dialysis for as long as I knew her. Her mother’s death had been profoundly difficult for her. She knew Joan had been writing a memoir, but she didn’t have the strength to do the work that would be required to get it ready for publication. So she listened to me cautiously, guardedly, to evaluate whether I had the passion and the talent and the technical skills to take charge of her mother’s legacy. She talked with me until she was satisfied she could trust me, and then she gave me her blessing. She guided her brother and her sisters into giving me the go-ahead as well, so the entire family was on board. If she couldn’t edit her mother’s book herself, Jan was at least determined to write the introduction for it. Her name carried weight; it would help the manuscript find a home. But Jan was so weak and ill, she wasn’t able to use a typewriter or keyboard any more. So over the course of months, Jan recorded the words of her introduction using a portable cassette tape recorder. She recorded in the bath sometimes, or sitting in a rocking chair outside her New Mexico home. She delivered a beautiful, heartfelt piece of work to me on a 20-minute cassette tape. Listening to Jan’s words, transcribing these sweet and intimate reminiscences about her mother, helped fill me with the determination to see this project through to success. In my previous blog post, I talked about how “Joan Haverty Kerouac” was the author’s name we put on a manuscript written by a woman who called herself Joan Stuart. Joan’s daughter Jan was another woman who had last-name issues. Jan didn’t meet her famous father, Jack Kerouac, until she was ten years old. Jack had denied paternity all Jan’s life, despite a court order and proof from a blood test. Running away from home at age 16, Jan boldly showed up on Jack’s doorstep. She spent a drunken afternoon with him. Jan told Jack she might like to write some day. “Use my name,” Jack memorably told her. 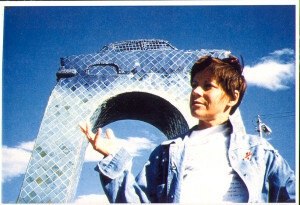 Jan didn’t take the name Kerouac until she became a writer. Jan and I talked on the phone often while I worked through Joan’s manuscript, organizing sentences and pages and chapters into a coherent whole. I got to meet her in person only one time. Jan and I attended the Beat Generation conference at New York University in summer 1994. We gave away small hand-printed chapbooks that contained chapter 12 of Nobody’s Wife—“the wedding chapter”—and Jan read from Joan’s manuscript in a panel on Women and the Beats. We met with a couple of publishing bigwigs. As a charismatic, well-respected novelist, Jan had some great contacts. As a member of the Kerouac bloodline, though, she had no pull whatsoever. The Jack Kerouac estate entirely excluded her. Not one item, not one dollar passed from Jack to his only daughter. Jan led a principled objection to the way Jack Kerouac’s manuscripts and belongings were being sold off piecemeal for scandalous amounts of money. She advocated that the whole literary estate should be in an academic library with access for scholars. Jan increasingly found doors closed to her as she continued to oppose the workings of the Jack Kerouac estate, speaking out in opposition to the sale of literary history to private collectors. We didn’t find a publishing contract for Nobody’s Wife at the NYU Beat Generation conference, but we found one soon afterward. In my last phone conversation with Jan Kerouac, I gave her good news. Creative Arts Book Company accepted the manuscript and offered a generous advance. Jan struggled to let me know how delighted she was. She sounded unbearably tired. Jan passed away in an Albuquerque hospital only a few days later, on June 5, 1996. The unfortunate postscript: Publication of Nobody’s Wife was delayed four more years as a sad circumstance of Jan’s death. Since she had written the book’s introduction, the fate of the book was tangled up in legal issues related to Jan’s own literary estate. These issues weren’t resolved in court until 2000. That’s when Nobody’s Wife finally saw the light of day, and many found it a fitting tribute to the memory and determination of Jan Kerouac. Cleaning out her worn little house in Oregon after her death in 1990, Joan’s daughter Jan Kerouac and son David Stuart found a mountain of paper under the bed. Typewritten pages were also discovered stashed in kitchen drawers and hidden in dismantled walls.The bones of the house contained draft after unfinished draft of Joan’s memoirs. Jan and David put all the crumbling paper-clipped pieces into a box, and the box went into David’s attic.A couple of years later, I persuaded David to haul the box down and allow me to rummage through it. The box went home with me, and I began indexing the scattered pages.I asked Joan’s family to give me the chance to try to prepare the manuscript for publication. Why would Joan Stuart’s life be of interest to a publisher? Because she spent two tumultuous years in the early 1950s as the wife of Jack Kerouac, while he was writing his pioneering novel On The Road. Born Joan Haverty, Joan took the married name Kerouac in 1950. Later there was yet another married name. Then at some point, Joan became tired of carrying any man’s name, including her father’s. Joan Stuart was a name she adopted in honor of her own independence. It wasn’t any family’s name, but it had a sound she liked. Writing was a way Joan worked out her own thoughts. She didn’t necessarily intend to share her words, and she may have hidden the pages that were most private and intimate to her. Joan’s written insights were often introverted and rich with self-awareness. But she also felt she wanted to respond publicly to the heroic portrayal that had grown around her ex-husband Jack since his death in 1969. She felt somewhat disgusted that this man who had treated her so poorly, so faithlessly and dishonestly, became a larger-than-life icon to millions. She couldn’t even get him to pay his child support. In 1961, she sold an angry article to the scandal sheet Confidential magazine titled “My Ex-Husband, Jack Kerouac, Is An Ingrate.” It was the only time she was published in her lifetime. When Joan started to write her book after the cancer diagnosis, she took role-model inspiration from her daughter Jan, who became a successful novelist on her own in the 1980s. The autobiographical Baby Driver came out in 1981, then Trainsong in 1988. I’ll have more to say about Jan Kerouac in my next blog post. It was my privilege to act as compiler, organizer, and editor of Nobody’s Wife on behalf of Joan’s family. I was lucky to be in the right place at the right time, while that box of papers was languishing and disintegrating in David’s attic, and to have the self-confidence to ask for the job. After getting a final manuscript pieced together from Joan’s pages, I had to act as the book’s agent as well. I contacted Creative Arts Book Company in San Francisco, because they had published Carolyn Cassady’s well-regarded beat-wife memoir Heart Beat. They accepted the manuscript and offered a generous advance. It was the last good news I had the chance to give Jan Kerouac in her lifetime. She passed away only a few days later, on June 5, 1996. My dealings with Creative Arts Book Company were mostly positive. Not surprisingly, they didn’t care to use “Joan Stuart” as the author’s name. Joan was re-christened Joan Haverty Kerouac. I was not pleased that Creative Arts did not give me the chance to read the page proofs before publication. The book came out with way too many typos! Creative Arts Book Company issued Nobody’s Wife: The Smart Aleck and the King of the Beats in August 2000. The book attracted plenty of attention, with enthusiastic reviews in Publishers Weekly and Library Journal. Jan’s introduction and Joan’s “wedding chapter” were excerpted in an anthology called Women of the Beat Generation, edited by Brenda Knight. Nobody’s Wife took a firm place in the constellation of books that are essential to understanding the backstory of Jack Kerouac and the other Beat Generation writers. Sad to say, Creative Arts Books didn’t stay in business much longer. You can find remaindered copies of Nobody’s Wife at bargain prices on the used-book sites. Even fifteen years later, it’s still attracting new reader reviews on amazon.com.